The Everyday Pinup Girl: Step Right Up! Come and See the Amazing Sideshow! Step Right Up! Come and See the Amazing Sideshow! 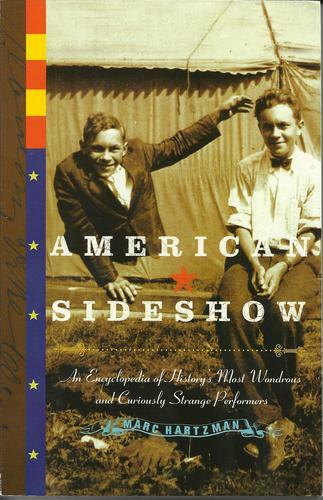 Recently I've finished reading American Sideshow by Marc Hartzman. It's a lovely book chronicling the sideshow in it's heyday in the late 1800's through today. Broken into three sections: The Golden Age, The Silver Age, and the Modern Age of the sideshow. Sideshows traveled throughout the country with circuses and carnivals showing marvels to the masses that had never before been seen. The arrival of these performers, animals, and oddities was a treat for the whole community, bringing the rest of the world into their small communities. There are still traveling sideshows throughout the country the Jim Rose Circus, the Brothers Grim Sideshow, and of course the only remaining stationary sideshow in the United States Coney Island USA's Sideshow by the Seashore. Yesterday, I actually attended the Sideshow by the Seashore and was very pleased to watch fire eating, climbing a ladder of swords, the human blockhead, the electric chair, an diminutive escape artist and bevy of other performances in a rotating one hour show along with a museum upstairs. If one of these comes to your town or you are in New York City and can make it to the Sideshow at Coney Island it is certainly worth the $10.00 entrance fee. There is also a museum upstairs for an extra dollar and film for an extra four dollars- in true sideshow spirit. Also, remember to bring some extra cash to tip the performers- this is how they make their living and between rents and NYC living expenses every dollar counts! Supporting this dying American art form is a real chance to step back into a time when the world was only limited by your imagination and an opportunity to experience the awe and excitement that our grandparents did. Amen sister. I vote we go visit the sideshow again soon!